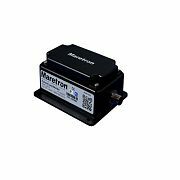 Maretron’s CLM100 converts commercially available 4-20mA current loop transducers into digital data so a wide variety of information can be displayed on compatible NMEA 2000® displays. Numerous 4-20mA current loop transducers are supported by the CLM100 including transducers for monitoring DC voltage and current, flow rate, distance, linear velocity and acceleration, angle, angular velocity and acceleration, temperature, humidity, resistance, strain gauges, force (load cells), pressure, decibels, and rotational rate. Some typical applications where the CLM100 is used together with a commercial available 4-20mA transducers include machinery monitoring using accelerometers and vibration sensors. Vibration monitoring of pumps, motors, fans, compressors, and gear boxes provides an early warning of potential problems resulting fewer breakdowns and reduced maintenance expenses. Another application example using the CLM100 is shaft speed monitoring. A commercially available 4-20mA rotational rate sensor is coupled to the shaft of interest and the CLM100 converts the transducer data to an RPM that can be read by a compatible NMEA 2000® display. And if you’re concerned about the force exerted on a mast stay or perhaps a vessel tow attachment point, commercially available clevis pins with a 4-20mA interface can be connected to the CLM100 and the corresponding load monitored using any of Maretron’s display products. The CLM100 is NMEA 2000® certified so you can view any and all information anywhere on the vessel using a compatible NMEA 2000® display. The CLM100 is a key component of Maretron's N2KView® vessel monitoring and control system.